Jordan Binnington is about to get a crash course in what Connor Hellebuyck faced last season. The St. Louis Blues‘ rookie goaltender will make his playoff debut against Hellebuyck and the high-powered Jets in Game 1 of their first-round series Wednesday night in Winnipeg. 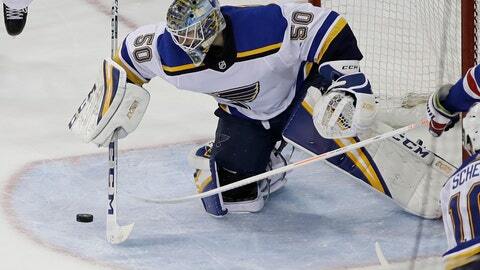 If Binnington can match what Hellebuyck did last year in his first taste of the Stanley Cup playoffs, the Blues could continue their surprising run after going from last in the NHL in January all the way to the postseason. Binnington hasn’t taken time to reflect on his 24-5-1 record with a .927 save percentage and league-leading 1.89 goals-against average since making his first start in January. The Jets are and should be thinking a lot about Binnington, who’s as much of an unknown quantity as there is in these playoffs. The 25-year-old languished in the minors before St. Louis turned to him midseason almost by default with starter Jake Allen not at his best and backup Chad Johnson struggling so much he was put on waivers. The Blues’ absurd turnaround from last place on Jan. 3 to third in the Central Division had a lot to do with Craig Berube replacing Mike Yeo as coach, but it also coincided with Binnington stepping into the crease. “Binner came up and won some games and played really well and we got on a streak and never really looked back,” veteran defenseman Jay Bouwmeester said. Hellebuyck hasn’t been quite as sharp this season after he backstopped the Jets to the Western Conference final a year ago with a .927 save percentage and 2.25 GAA in the first two rounds. Still, going that run should help him the second time around. It’s not just Hellebuyck, either. Save for a handful of guys who were around for a first-round sweep at the hands of Anaheim in 2015, last year was the first chance for a lot of Jets players to get on the ice in the playoffs, including young guns Patrik Laine, Kyle Connor and Nikolaj Ehlers. Berube expects banged-up center Tyler Bozak and defenseman Colton Parayko to be able to go. Winnipeg will be without forward Brandon Tanev for Game 1, coach Paul Maurice said, but should have top-four defenseman Josh Morrissey back after missing six weeks with an upper-body injury. The Jets played long stretches without Morrissey and top defenseman Dustin Byfuglien and still managed to finish second in the division. When the Blues had a bad first couple of months of the season, center Ryan O’Reilly was still on his game and producing. Acquired from Buffalo in a trade last summer, O’Reilly has been exactly what St. Louis has needed and led the team with 77 points. O’Reilly won 56.9% of his faceoffs, good for eighth in the league, and the matchup against Winnipeg’s Adam Lowry — who ranked seventh — will be one to watch. Like Berube, Maurice took over the Jets during the season, but that was back in 2013-14. Berube is an interim coach for the second time after replacing Peter Laviolette with Philadelphia three games into the 2013-14 season. He said he has approached St. Louis differently. That’s a very north-south brand of hockey that has fit the Blues well. And the biggest difference between Berube and Yeo is practice, where the new coach runs a tight ship, is quick to blow the whistle to stop drills and believes those habits translate to games.